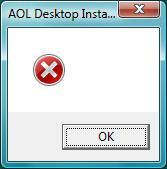 I recently was asked to resolve another problem with AOL Desktop - the 'Main.idx' had disappeared from the AOL profile folder within ProgramData and the program could not start. After some checks, I decided to completely uninstall and reinstall the AOL software. Although the removal was straightforward, I could not reinstall the software no matter which way I tried. The following error 'message' kept appearing, followed by a completely white square that could only be closed using Task Manager. Honestly, could this error be any more helpful? Fortunately, the solution was simple - uninstall Adobe Flash Player for Internet Explorer (ActiveX). As the customer was using Windows Vista, this was unlikely to cause a problem since the latest version of Internet Explorer that runs on Vista is 9.0. This is too old to be useful, and another browser such as Google Chrome or Mozilla FireFox is required for regular browsing. I did not try reinstalling Flash Player after successfully installing AOL Desktop, so I'm not sure if similar problems would have returned or not. Coincidentally, my very next job was also for someone running Windows Vista with a similar problem, though this was with the software for a Brother scanner. Instead of the usual controls for scanning images and files, a white space in the shape of the original program appeared. As before, uninstalling Adobe Flash Player for Internet Explorer did the trick, although the customer did comment that the program looked a bit different than it did before. I think it's likely that there is a problem with Adobe Flash Player 20 and Windows Vista, or perhaps with Internet Explorer 9, or perhaps with any number of different programs - who knows? Amazing blog and unique content. i like it.. thanks for sharing it... keep it up. Call now on toll free number +1-844-480-1757 to get instant 24/7 & Click here for more information Aol Support Phone Number . AOL mail support phone number +1-888-809-7444. Download & Install AOL Desktop Gold window 7, 8, 10. You can Download AOL desktop Gold Easily From Here. if you are unable to download AOL Desktop gold Contact us 1-855-500-8462. AOL desktop gold by providing complete assistance. We are 24*7 happy to help you. Are you facing the problem related to aol mail not receiving emails. visit askprob to get your problem resolved. Get Solution to AOL Desktop Gold Software Issues When You Download and Install, Solve Login, password & account Errors using troubleshooting Assist guides.Various options to contact aol Gold customer care and Get solution of there Desktop gold problems such as I get prompted to update Microsoft .NET Framework.